Forests are a significant part of the global carbon cycle and are increasingly viewed as tools for mitigating climate change. Natural disturbances, such as fire, can reduce carbon storage. However, many forests and dependent species evolved with frequent fire as an integral ecosystem process. We used a landscape forest simulation model to evaluate the effects of endangered species habitat management on carbon sequestration. We compared unmanaged forests (control) to forests managed with prescribed burning and prescribed burning combined with thinning. Management treatments followed guidelines of the recovery plan for the endangered red-cockaded woodpecker (RCW), which requires low-density longleaf pine (Pinus palustris) forest. The unmanaged treatment provided the greatest carbon storage, but at the cost of lost RCW habitat. Thinning and burning treatments expanded RCW habitat by increasing the dominance of longleaf pine and reducing forest density, but stored 22% less total ecosystem carbon compared to the control. Our results demonstrate that continued carbon sequestration and the provision of RCW habitat are not incompatible goals, although there is a tradeoff between habitat extent and total ecosystem carbon across the landscape. Management for RCW habitat might also increase ecosystem resilience, as longleaf pine is tolerant of fire and drought, and resistant to pests. Restoring fire-adapted forests requires a reduction in carbon. 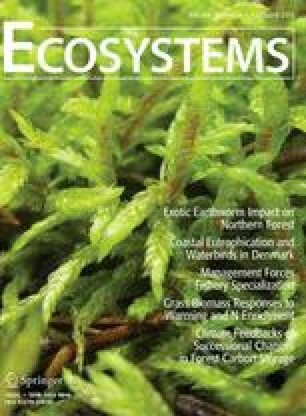 However, the size of the reduction, the effects on sequestration rates, and the co-benefits from other ecosystem services should be evaluated in the context of the specific forest community targeted for restoration. KLM performed research and analyzed the data; MDH, BAH, GWK, and MPN conceived of and designed the study; KLM, MDH, BAH, GWK, and MPN wrote the paper. The online version of this article (doi: 10.1007/s10021-014-9813-1) contains supplementary material, which is available to authorized users. Funding for this research was provided by the US Department of Defense’s Strategic Environmental Research Development Program (SERDP). We thank the Ft. Benning field crew for assistance with data collection and James Parker and Rob Addington for providing data and facilitating access to field locations. We are grateful for the constructive feedback from anonymous reviewers. Supplementary material 1 (DOCX 21 kb). Dangal SRS, Felzer BS, Hurteau MD. 2014. Effects of agriculture and timber harvest on carbon sequestration in the eastern US forests. J Geophys Res. doi: 10.1002/2013JG002409. NRCS. 2013. Web Soil Survey. United States Department of Agriculture Natural Resources Conservation Service. Available online at http://websoilsurvey.nrcs.usda.gov. Accessed 1 July 2013.